The wonderful Dan Martin announced at the end of our staff meetings that he planned to head to somewhere in France for a couple of days on the weekend and had room for three passengers. 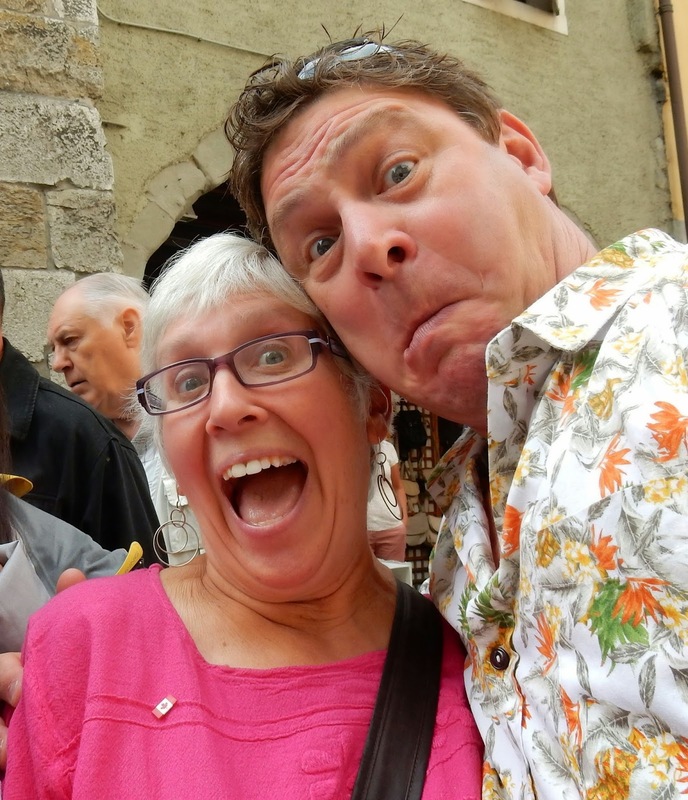 Terry and I were the lucky ones to go, and there was room for Bob, too! 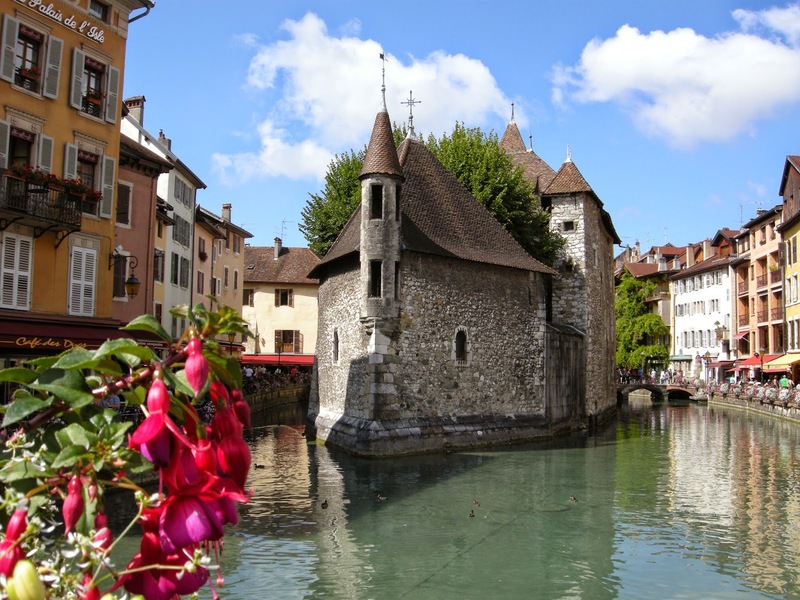 We got away just after 14:00 on Friday afternoon and headed towards the Alps, some 35 kilometres south of Geneva. 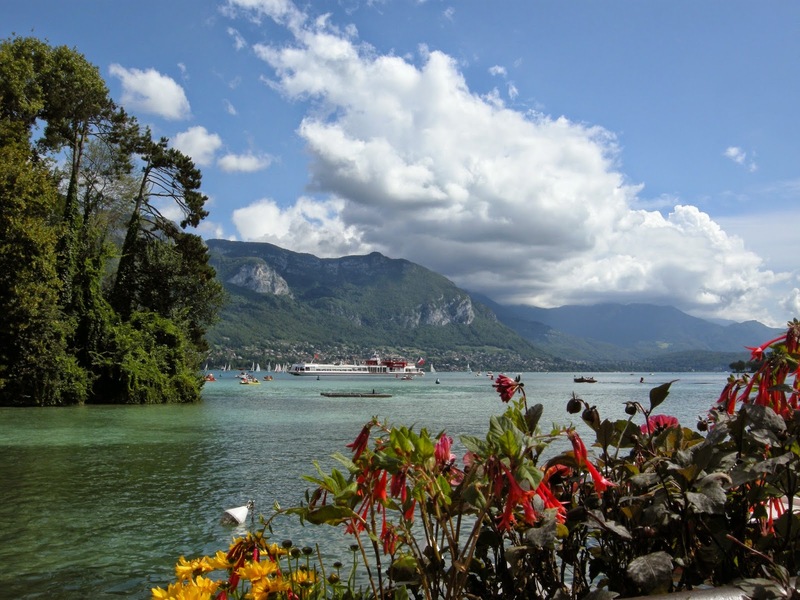 Dan had managed to get us a great deal at an Ibis just outside of town, so we checked in there first before heading into Annecy, one of his favourite places to visit. 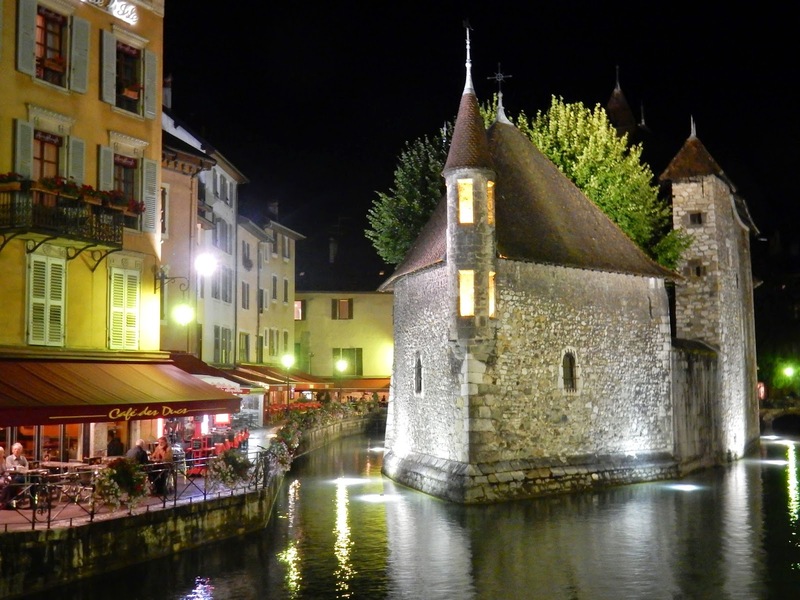 The dark clouds on Friday evening did not detract from lovely Annecy. 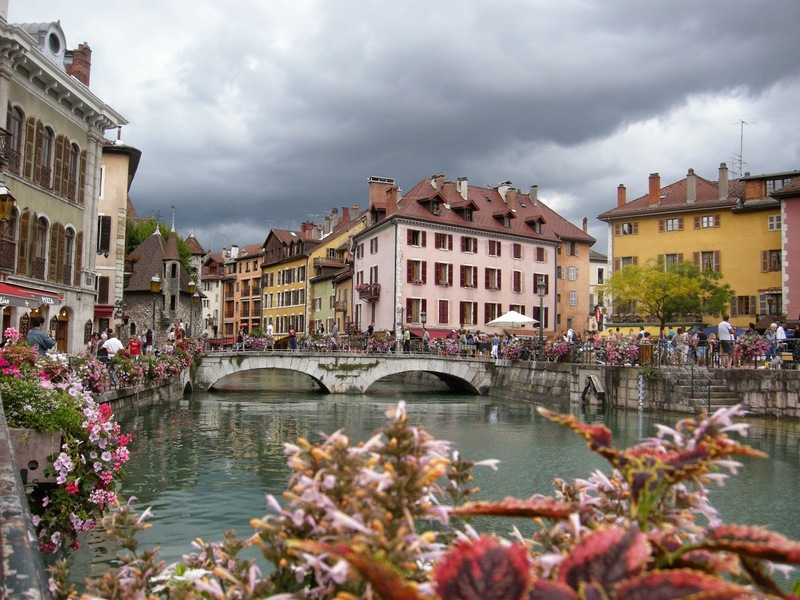 Annecy is a popular vacation spot because of its setting on a small mountain fed lake and its "charme". 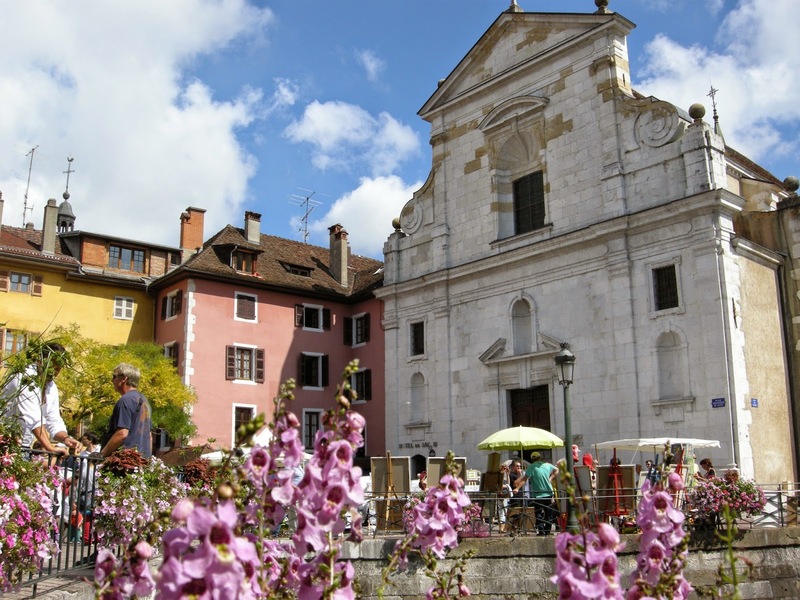 The town is defined by its canals, which has earned it the nickname of The Alpine Venezia. Bridges zigzag across these narrow waterways while cafés and shops are aligned alongside them. To add to the beauty of the place, flower boxes are everywhere, adorning the bridges, walkways and buildings in the town. A refreshment break with Dan and Terry. On Friday night, the skies were threatening when we first arrived and then they opened up for a couple of hours. No problem. We were able to stay dry under vaulted walkways. I think I enjoyed this part of the day most since we traveled from shop to shop to avoid getting wet. After dinner, we emerged from the restaurant to clear skies and a pleasant evening, a good sign for the next day. Saturday turned out to be ideal, weather-wise. We decided to go our separate ways until lunch. 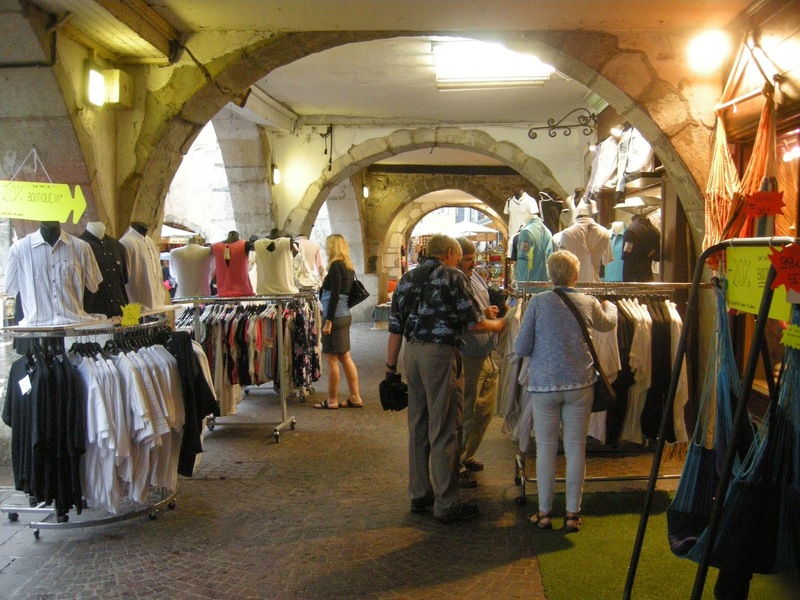 While Terry took a walk along the lake, Dan, Bob and I wandered among the wares being sold in the square. 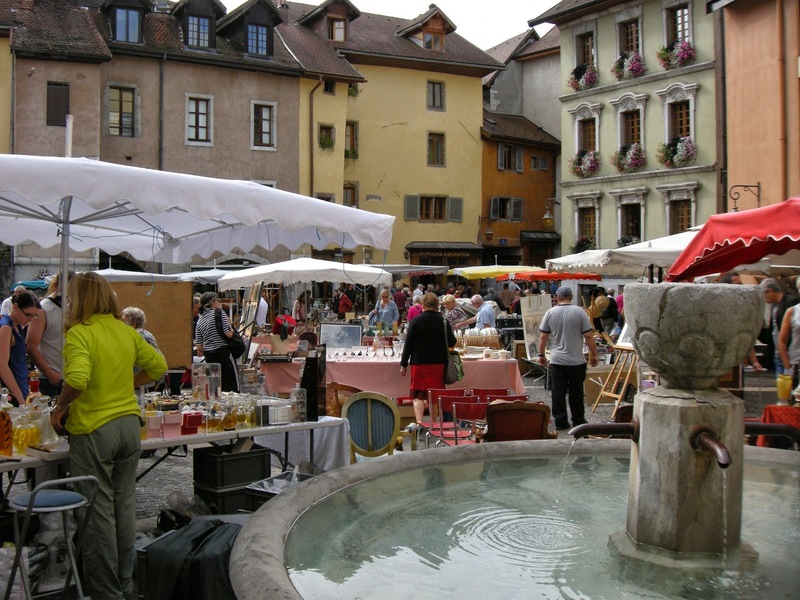 On the last Saturday of each month, Annecy holds a large "brocante" (Collectibles) market, a strong selling point of the place for Bob. I came upon a group of Brits filming a a show of some kind. When I asked what was going on, the host grabbed me and we posed for this selfie together. I have since learned that he is Mark Franks who has made his name in talk shows, but is also an expert in antiques. His show is on Channel 4 and is called The French Collection. I also visited the Palais de l'Isle, the most unique building in the town. It is shaped like a boat and lies in the middle of a canal. A palace when first erected in 1132, it has also been a courthouse, a mint, and most recently, during the German occupation of France, a jail. 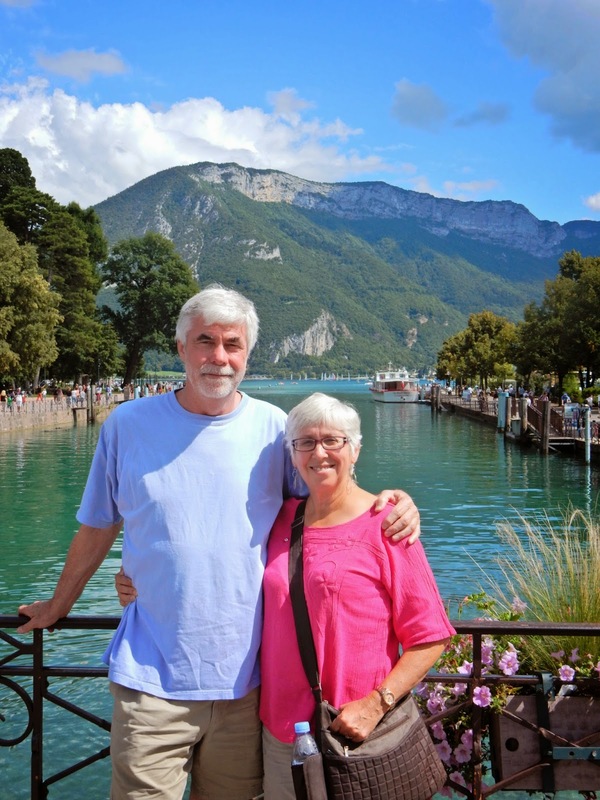 There was lots of time to explore Annecy before lunch, so Bob and I took many pictures. The Palais de l'Isle again. 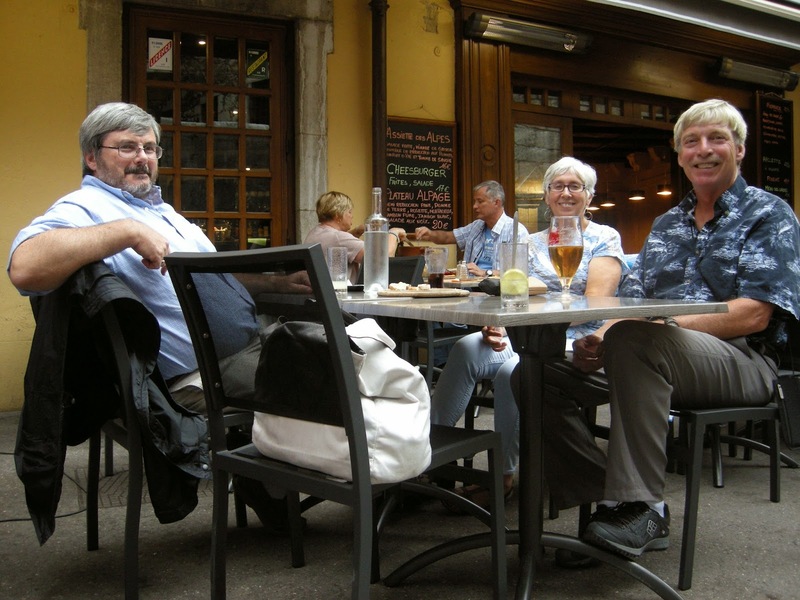 At lunch, Terry, Dan and I tried a local specialty, a tartiflette, which is a cheese and potato casserole topped with Reblochon cheese. Yum! Afterwards, we strolled along the lakeside before heading home. This was a perfect day to enjoy the water and the mountains in the distance. Thanks, Dan, for taking us to this place. We were truly enchantés.